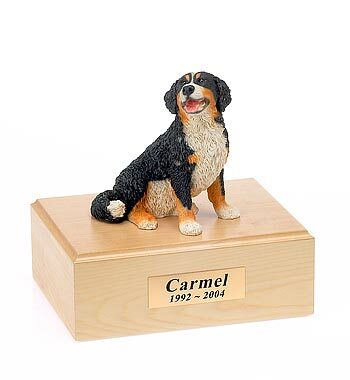 Originally sculpted by a respected U.S. sculptor, the Original Edition is truly a one of kind memorial pet urn, having received a U.S. Patent. Each Original Edition is individually handmade and available in four color styles. Selection of over 500 dog and cat figurines. After the death of a pet, it is natural to want to honor the loved one you have lost. The Original Edition angel pet urn with figurine has been noted as giving comfort after the death of a pet because of its beauty. 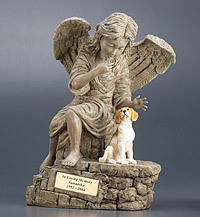 The Original Edition angel was sculpted by a well-respected U.S. artist to be a one of a kind pet loss memorial. Due to the uniqueness of these pet cremation urns, Angel Ashes was awarded a patent from the U.S. Patent Office in May 2004. The figurines that accompany the angel pet urns are remarkably true to life in design. Figurines are available for dogs, cats, rabbits, ferrets, parrots and horses. Figurines are nestled next to the angel underneath his outstretched hand offering comfort and reassurance after the death of a pet. Original Edition angel cat and dog urns are cast in designer resin and are available in four finishes: Bronze Patina, Hand Painted, Marble and Stone. Each Original Edition pet cremation urn is approximately 15-3/4" tall, 11-3/4" wide and 7-7/8" deep and will accommodate a pet up to 150 lbs. To offer additional consolation after the death of a pet, your Original Edition urn is personalized with a solid brass nameplate with an inscription of your choosing. The inscription may be one, two or three lines. We provide a choice of nameplate colors: Gold Bright Brass, Blue Marbleized, Brown Marbleized or Green Marbleized. Visit the Personalization Page to view actual nameplate colors and inscription styles. Your pet's bagged cremains are placed in the urn via an access cover on the bottom of the base. This access cover has a hinge and clasp to secure the ashes. Please refer to our FAQ for suggested additional directions on how to place you pet's cremains in your Original Edition pet loss memorial. There are four felt pads to protect the surface where your urn is placed. Yes I received the beautiful urn intact. Thank you for the personalized touch. My family and I are so happy we selected one of your urns for the remains of our beloved dog Reggie. It has given us a great deal of comfort to have him in our home. Thank you very much for your shipping confirmation. We did receive the urn, and we're very pleased with it. Thank you so much for the quick response to the order; I had the urn before I had Sasha's remains. It was very comforting for our family to be able to establish her memorial right away.